Those seeking social change and those who want to maintain the status quo expressed their hopes and fears in the only way open to them in 1647 – through the Old and New Testaments. Corinna Lotz reviews a timely revival. 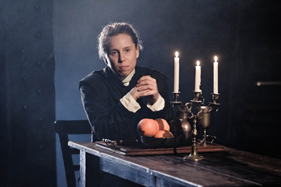 The heightened religious fervour of 17th century England permeates from the start of this revival of Caryl Churchill’s 1976 play, Light Shining in Buckinghamshire. Actors bearing candles chant in unison as they converge towards the stage along the furrows of a cross dug out in soil. Only a plain wooden table with three candles relieves the gloom: it is a harsh place in harsh times. A monumental Civil War is unresolved and the stakes could not be higher. The old society, hitherto dominated by feudal absolutism, is being challenged on the battlefield by the forces of Parliament who reflect the needs of an emerging capitalist class. The divisions which rent society are brought to life in Churchill’s script, which is closely based on transcripts and pamphlets of the time. The play’s name is taken from a 1648 tract written by the Diggers, who sought to create egalitarian farming communities in a challenge to the landowning classes. The rising middle classes had to transform the foundations of economic and political power and defeat the old aristocracy by means of revolution and civil wars. But in order to take on the ruling classes militarily, the Cromwellians needed the support of those below them. The poor hoped their turn would come. The very foundations of society were rocked by an elemental upsurge, stoked by injustice and set on fire by the apocalyptic speeches of Agitators and Ranters. 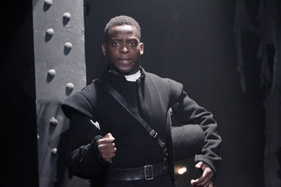 The turmoil in people’s hearts and minds is brilliantly brought to life in the opening scene, where Cobbe (Christopher Harper) is tormented by lust and his fear of hell. The life of the poor is truly devastating. Humiliation and persecution was their lot. Justices of the Peace find the homeless and penniless Margaret Brotherton (Helena Lymbery) guilty of vagrancy and sentence her “to be stripped to the waist and beaten to the bounds of this parish and returned parish by parish to… where she was born”. In a mesmerising scene, Lymbery and Michelle Terry show how in the chaos of revolution, two downtrodden women of the day marvel at the possessions of their masters – a mirror, wool blankets and linen sheets. In Part Two, the conflict within the New Model Army between the senior officers (the Grandees) and the Agitators, who stood for the interests of the ordinary men, reaches its peak. On 28 October 1647, a document called An Agreement of the People, prepared by those who wanted a democratic republic, is presented to the General Council of the Army. The cut-and-thrust between Leveller Colonel Thomas Rainborough (Jamie Ballard), Oliver Cromwell (Kobna Holdbrook-Smith) and Cromwell’s son-in-law General Ireton (Michelle Terry) raises issues which remain burningly relevant. The Arcola’s revival of this 1976 play is full of resonance at a time when the old British parliamentarianism has to give way to something new and democratic. All praise to director Polly Findlay and Strawberry Vale Productions. Light Shining in Buckinghamshire runs until 7 August at the Arcola, Dalston. Box office 020 7503 1646. Tickets £16/£10. Tickets are £48 which includes the show at the Arcola Theatre followed by a reception of food, drink, opinions and music. All proceeds go directly towards securing the production.